In this capacity, Mr. Butler oversees Intelsat General’s strategic direction, operational plans and execution of the overall mission to provide a range of sustainable, cost-effective and secure communications solutions to government and commercial customers. Mr. Butler most recently served as Vice President of Satellite Networks and Space Services at Intelsat General, and prior to that held positions in strategy and business development since joining the company in 2006. During his tenure he has led a number of initiatives to provide innovative, mission-critical solutions ranging from hosted payloads to global satellite networks for government and commercial customers worldwide. Prior to joining Intelsat, Mr. Butler worked at DRS Spacelink as Director of Business Development, leading strategy and solutions for the company’s satellite services business line. He began his career in the satellite industry in 1999 with Verestar where he held sales and business development roles and launched the company’s government services unit. Mr. Butler is a graduate of the University of Phoenix and has a Masters of Business Administration from the University of Maryland, College Park. He stays active in the industry and has served as the President of the Mid-Atlantic Chapter of SSPI, on the Board of the Washington Space Business Roundtable and represents IGC on the Commercial Space INFOSEC Working Group (CSIWG) and on other assignments. 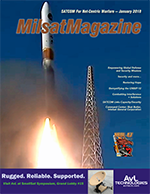 Mr. Butler, thanks for taking the time to “chat” with the readers of MilsatMagazine. How did you initially become interested in the SATCOM and MILSATCOM market segments? Artistic rendition of an Intelsat EpicNG satellite on orbit. Image is courtesy of Intelsat General. In the late 1990s, I was looking to make a career change; I had friends in the COMSATCOM business who made some introductions for me. I had a background in sales and business development and the industry seemed like an exciting place to be, though I knew nothing about space, satellites, or even telecommunications at that time. I was lucky that this was before the dot com bust and the need for internet trunking over satellite to places like Africa and Latin America was booming. Everyone wanted access to the U.S. backbone, which was where something like 80 percent of the internet content was cached at the time. After the terrorist attacks on September 11, 2001, I saw an opportunity to participate in a small way by providing critical SATCOM solutions to the warfighter. Since that time, I have come to better appreciate the important role that our industry plays in delivering critical, timely information to decision makers from the battlefield to the Pentagon. In March of 2016, you were promoted from the position of Vice President of Satellite Networks and Space Services to the role of President of Intelsat General. Now, nearly two years later, has your transition been as you expected? What areas of the business have been somewhat of a surprise to you? I don’t think anything has been a particular surprise to me. I will say that I have gained a much greater appreciation for the role that each individual in my organization plays to the overall success of the mission. It’s easy to say that we simply meet a market demand with a commercial product, but the dedication of our people to the customer mission that I see in the office every day is inspiring. We have a good mix of former members of the armed services and industry veterans, which means we both understand the users and have the technical expertise to rapidly deliver what they need, while also providing the critical on-going support to help ensure they achieve their objectives. Given your breadth of experience in this industry, when you look back upon your career, what projects or missions truly bring a smile of satisfaction to you? The greatest satisfaction comes from enabling our customers to do something they could not do previously — to help them close a capability gap. Whether it is helping them to reach a location with connectivity, achieve a new milestone in data speeds, or enable the use of a new piece of hardware that provides a step function in capability—this is an experience I have the privilege to encounter regularly. There is nothing more frustrating than not being able to meet a customer need, and nothing more satisfying than exceeding their expectations. High-throughput satellites (HTS) have gained quite a bit of momentum over the last few years. Please explain Intelsat General’s goals for deploying HTS, especially for the government user. Intelsat General offers government customers increased satellite performance in our new constellation of EpicNG high-throughput satellites. These new spacecraft mark the progressive evolution of our global network, incorporating new C-, Ku- and Ka- spot beams into our fleet to create differentiated solutions for a range of commercial and government applications. Higher throughput offers government users more value for each bit of data they receive, with an efficiency improvement of nearly 300 percent over conventional wide-beam satellites. The EpicNG spot-beam technology is ideal for mobile applications, offering commercial and government users high-speed connectivity wherever they go. For land, sea and air missions, the platforms used by warfighters need smaller antennas to receive and send vital voice, data and video. The Intelsat EpicNG HTS satellites deliver high power to small satellite beams that support smaller terminals, as small as 20 cm in diameter. For aeronautical applications, we are leveraging technology that is already deployed on commercial airliners — high-speed internet access and content services at 35,000 feet. The improvements in antenna technology over the past few years are just now coming to market, and our military and government customers are able to take advantage of the new antennas in a range of mobile applications. Now that Intelsat General has four Intelsat EpicNG satellites deployed, what capabilities are gaining most interest from potential government users? One of the top requirements among all government customers is the need for more resilient broadband via satellite, which our EpicNG satellites can deliver. Broadband connectivity can support many missions, but the area gaining the most interest is for critical intelligence, surveillance and reconnaissance (ISR) missions. In the last month, Congress discussed this constantly growing requirement and how to address it effectively for ongoing military superiority. Congressional committee members looked at recent data that shows ISR requirements grew by more than 800 percent in the last 10 years, yet still not all of those requirements were met. Commercial satellite capacity is available to help meet this demand. HTS has the coverage, the volume of bandwidth, and the security to enable ISR. As you may know, commercial satellites have supported this huge need over the last decade by providing bandwidth to remotely piloted aircraft (RPAs) delivering much needed situational awareness. More RPAs continue to be deployed and new, smaller RPAs, in the Class III category, are looking to commercial SATCOM for beyond-line-of-sight communications that have not previously been possible. These aircraft can now include this capability because small antennas can fit on the limited space of these platforms, enabling both military and non-military applications. IGC follows these RPA trends each day and does not foresee interest slowing any time soon. Can you please explain the advantages that EpicNG satellites bring to DoD users, specifically? Intelsat’s Globalized Network has a proven track record of reliability, security and performance for the most demanding government communications. In addition, the Intelsat fleet of more than 50 satellites provides the flexibility and resiliency to keep pace with the military’s changing geographic and mission requirements across the globe. 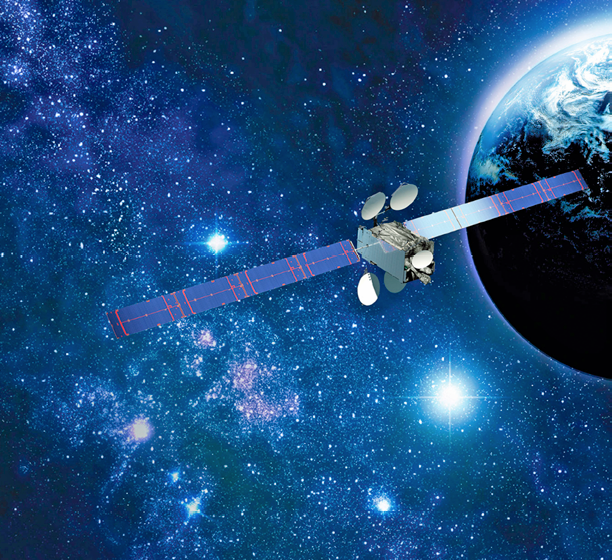 The new Intelsat EpicNG satellites enable throughput in the range of 25 to 60 Gbps per satellite, nearly 10 times that of traditional wide-beam satellites, including the U.S. government’s WGS satellites. This EpicNG throughput delivers both technical and economic benefits that are extremely valuable to DoD users. These advanced satellites deliver more efficiency for the bandwidth used, provide very high throughput to a concentrated area using the spot-beam technology, and offer backward compatibility because they use the Ku-band frequency already deployed across the DoD. You have completed several tests on the Intelsat EpicNG platform over the last two years — please provide an overview of the tests and the information that you gained from these tests. Our most recent tests proved two important elements: smooth data transmissions during long-distance RPA missions and much improved interference mitigation. 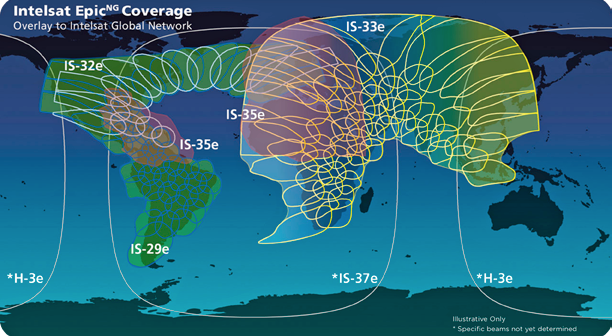 Intelsat’s EpicNG platform uses multiple spot beams, each covering approximately a 700-mile radius. This multiple-spot-beam design is found in most HTS spacecraft, which as I said earlier allows for the use of much smaller ground antennas. Intelsat General joined up with General Atomics Aeronautical Systems Inc. (GA-ASI) to test the spot-beam technology. 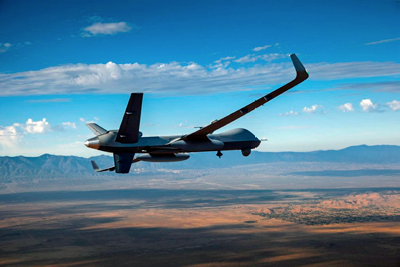 The tests proved smooth switching capabilities for the company’s Block 5 Predator B/MQ-9 while communicating with the Intelsat 29e satellite over very long distances that require switching over multiple spot beams. This test also represented the first time the MQ-9 transmitted over a high-throughput satellite. Since this unmanned platform is so widely used by the DoD and allied governments, we believe this test will prove very significant to future RPA operations. For the interference mitigation testing, IGC proved that the EpicNG spot beams could limit jamming or interference from any source, including adversaries, so that the user could have uninterrupted communications. Older satellites use one broad beam that can cover the entire continent, for example. This increases the likelihood of satellite communications being interrupted either accidentally or purposefully. The 700-mile radius for each EpicNG beam means that a jammer must be in that spot beam for the jamming to occur. If they do jam the signal, IGC has now proven that it can disconnect the uplink signal from the downlink signal, find a new frequency for the RPA and reestablish a link, essentially neutralizing the jammer. In 2016, we also demonstrated the unprecedented performance of EpicNG with very small satellite terminals. A series of tests were performed using Gilat’s BlackRay 71 airborne terminal, with its mechanically steered 6” by 6” flat panel array. Data was sent from the small antenna to the Intelsat 29e satellite at a rate of 3.9 Mbps with an efficiency of 0.26 bits/Hz. This compares to an uplink rate of about 1.8 Mbps and efficiency of 0.09 bits/Hz achieved with a conventional Ku-band wide-beam satellite. This link was effectively two times the rate and almost three times more efficient than traditional wide-beam satellites. These tests represented another milestone—effective use of HTS with small aero terminals that the U.S. Department of Defense and allied military forces urgently need. The DoD needs to become more resilient in its satellite capabilities. Please tell us how IGC is addressing this issue and how HTS specifically addresses resilience issues. Agility and resiliency have become critical to national security space and will contribute to overall mission assurance. Hundreds of commercial satellites orbit the globe today and thousands more are planned for the near future. Operators launch satellites several times each year, providing the opportunity to deploy innovation regularly and deliver resilient technology that supports military space operations. To maintain optimal agility throughout the DoD, commercial SATCOM capabilities must be designed into the space architecture so these satellites will have a role in ensuring resilience. When commercial capacity and capabilities become part of the long-term military space fabric, commercial will accelerate investment in yet more advanced technology specific to the needs of the DoD. Does the working interface between Intelsat General and Intelsat S.A. provide clarity regarding mission development and internal/external resources? Please explain how your subsidiary works directly with Intelsat S.A.
IGC leverages the global infrastructure investments that Intelsat makes for our government customers, both in space and on the ground. In addition, IGC influences those investments and satellite designs to better serve the unique requirements that the U.S. DoD and global militaries expect in order to maximize our satellite capabilities and meet those requirements. As an example, Intelsat has long built our satellites with the ability to transmit encrypted commands to our satellites using NSA-approved equipment in order to meet U.S. DoD expectations. More recently, Intelsat began designing our satellites with the ability to employ NSA-approved encryption on telemetry from the satellite to the earth as well. We continue to invest on behalf of our government users. What are your thoughts regarding the enthusiasm surrounding the development of small satellites and the attendant constellations? Is Intelsat General considering such technologies for use within the military community? If so, what can you tell us regarding this. As new satellite technology continues to evolve, we will watch carefully to see how it can be leveraged for our customers. For the near future, we are focused on smaller Low Earth Orbit (LEO) satellites from OneWeb. This innovative technology partner will help to meet the growing demands for Big Data, with high-throughout and low-latency services. Are Hosted Payloads of continuing interest to Intelsat General and is there any progress on that front? IGC continues to see great value in hosted payloads for government applications. We have seen a bit of progress in government use of hosted payloads and encourage the government to expand their investment in this area and design HPs into their future architecture. Are your partnerships with other firms proving fruitful? Everyone knows about the OneWeb acquisition/partnership withdrawal… what may the industry expect from IGC with new partnerships, such as Kymeta? IGC has developed relationships with several innovative technology partners. As you mention, Kymeta is one of these partners. IGC is working with the company to address the need referenced above—smaller and lighter antennas for mobility applications. Kymeta is designing and beginning to deliver low-profile, flat-panel antennas. Flat-panel antennas are scalable and also have no aerodynamic issues so they can easily fit onto a ship, a car, or comparable military platforms. Military users look forward to having a new antenna technology that provides access to high-speed connectivity with lower size, weight and power. Our partnership with OneWeb will bring another advantage to our government customers. This LEO constellation will help IGC provide high-throughput access anywhere on the globe, including the Polar Regions, especially for users who are mobile and need connectivity to a small terminal. Just like people expect to have connectivity on their mobile phones and other devices, we will have this service with much higher speeds and integrate it into our Intelsat EpicNG network so that we can deliver the most appropriate service to each user. As a commercial technology provider, IGC is always looking at new ways to provide innovation to our customers. For government users, they need cutting edge technology that is available quickly to support requirements around the globe. In 2018, we believe that our customers will begin to see the value in our managed services, like IntelsatOne Flex. With these services, we will provide bandwidth and all related technology and service as one solution. By delivering a service and not just providing bandwidth, IGC can layer in new technology as it is available and applicable to each user so they can focus on their mission and not the connectivity technology. In addition, we can look for efficiencies wherever possible. For example, we can work with users to determine when and where they need specific connectivity service. If they do not need to continue the service, they do not need to pay for it. We will offer this Flex service to support surges or new locations without significant changes in cost. I believe that new users can understand this model if they think of it in the same way they use their mobile phones. People do not buy bandwidth in each area where they may be, or go to several different providers because they move around. Intelsat Flex will follow this type of structure in a comprehensive service. An area that remains of concern is a perceived lack of technical talent available for filling important positions within the SATCOM and MILSATCOM industries. How can companies such as yours assist in STEM training for young students at the junior high, high school and college levels to develop an interest in learning the skills necessary for a fulfilling career within the industry’s various market segments? Those in the space industry want to stimulate growth and development that will help transform today’s students into tomorrow’s space leaders. Space has provided the commercial world with many great new technologies that we now depend on daily, GPS being just one. IGC wants to ensure that young people are motivated to join the space industry to continue this evolution of technology, and maybe even get us to Mars and beyond. With government clients increasingly looking to commercial providers for a range of space and satellite technology and services, our participation in STEM education is critical for maintaining our country’s technological edge in space. IGC has invested in an active internship program and works with groups such as the Future Space Leaders Foundation (FSLF) and SSPI, organizations dedicated to the career development of young space and satellite industry professionals in this exciting and growing field. Our staff goes to colleges across the country to recruit new talent and help teach students about the amazing technology that space is creating today. I am passionate about STEM and space and hope that IGC can inspire a new generation of space technology innovators.